To access Team Foundation Server (TFS) we use a VPN. For a testing scenario I wanted a hyper-v VM to connect to TFS, here’s how I set this up without configuring a VPN inside the VM. First make sure the VPN connection is started on the host before you start the hyper-v VM. I’ve read somewhere this was needed and it does work this way. Use the virtual switch that is on the same adapter as the VPN. I’m only using the Wifi adapter. 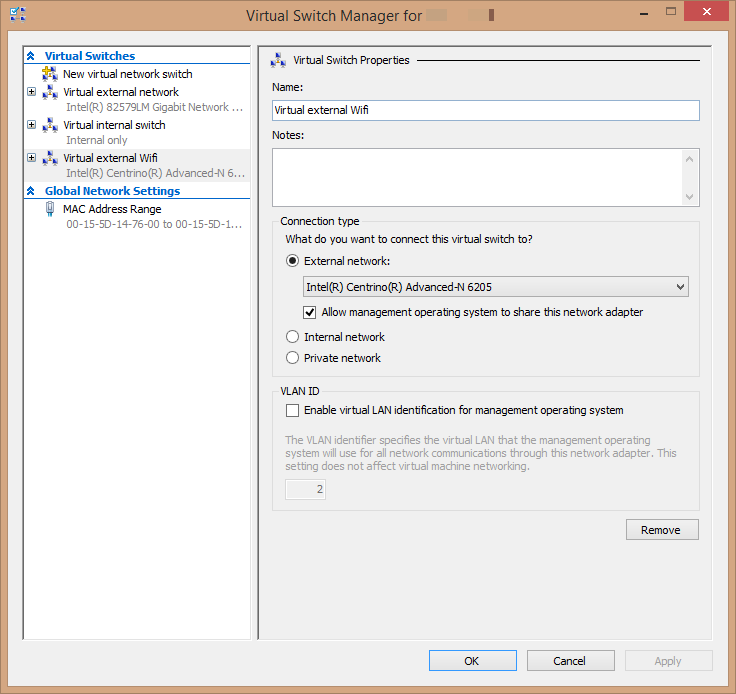 Below is a screenshot of the Virtual Switch Manager for the virtual switch I use in the VM’s settings. For the proxy I’m using Fiddler. Awesome tool for web debugging, but also a proxy. Install this on the host. (not the VM) Check the option to allow remote computers to connect. Now the traffic from the hyper-v vm will go through the VPN of the host. This entry was posted in Tooling and tagged Fiddler, Hyper-V, VPN. Bookmark the permalink.